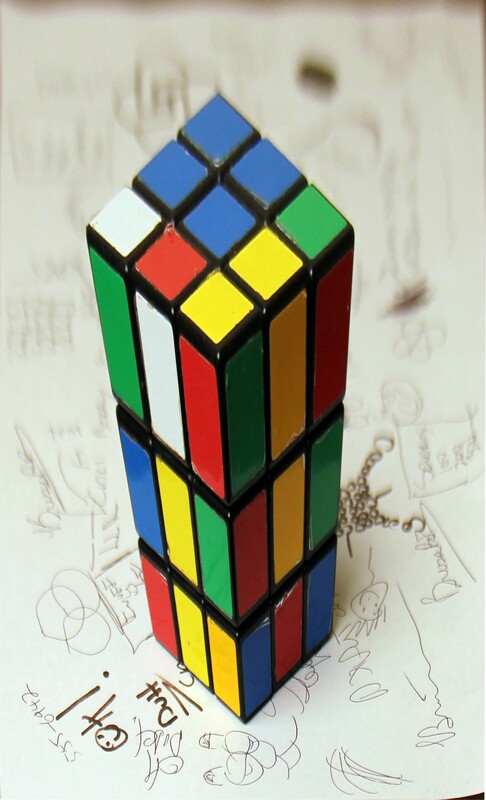 How do you make a plastic bottle sit on top of a Rubik's Cube without a Rubik's Cube? It may seem like a brain teaser, but it's more like something you would see in an Escher drawing. An optical illusion. A three-dimensional world trapped in a two-dimensional image, which is exactly what's going on in this Rubik's Cube illusion. All you need to do is take a picture of the Rubik's Cube (or other similar 3D-centric subject) and something beside it for reference, as brusspup does in the video below. Then print it out, put it down on a table, and slap something on top of it for final illusion. For an even crazier take on this, check out brusspup's other video below, which is a great anamorphic Rubik's Cube illusion. A little Photoshop experience may be required for this one (or you can just print out his version). If you try this out yourself, post your results below! Reminds me of those street paintings you see on the ground where the artist makes it look like there's a huge pit, or some crazy world below you... Can't remember the link off the top of my head, but you know what I'm talking about... right? Hey Jon, the video has been updated; we found the original video and replaced it! Check it out. Or the type in parking structures that are at extreme angles like they were projected from headlights and then painted on whatever surface it touched. But when you look at it from the correct angle, you read it perfectly.